Wow, a proper attempt at a DJ app for Android! It’s got a lot going for it, too: Decent workflow, good looks, great sounding FX, great sync engine, “slip” mode, proper loops and cues. The big omission, though, is any kind of split cueing, and that needs to be added if the app is to move past first base. You can sort by artist, album (shown), song, playlist or genre, and there’s even a section for your own recordings, but it would be nice to have a genre column in the song list, which is where most DJs will work from, I suspect. The app looks simple but nonetheless is quite slick. The software has parallel waveforms that you can switch to become two whole-track waveforms, and there’s a circular beat/bar counter, similar to other MixVibes Cross software. This is one of many nice touches in the app. On a Nexus 5 smartphone, the orange and blue decks move reasonably smoothly and the waveforms scroll OK, although for some reason overall the animation was sometimes jerky and at other times close to perfect. MixVibes has wisely realised that people are going to want simplicity here; there are big cue, play and sync buttons a crossfader and not much else on the main screen. The Sync buttons work well with most dance music I tried it on, as the app pre-analyses and attempts to beatgrid the music first (would be good to be able to adjust the beatgrid, though). You can manually beatmatch, too; holding the middle of a jog and moving up engages BPM change (moving clockwise or anticlockwise then increases/decreases the BPM) while swiping left/right is like nudging. Holding the jog and doing a scratch movements initiates a pretty convincing scratch sound. But as I say, it’s been kept simple; to access other functions, you need to press buttons to bring up further screens. The first of these buttons is the little loop icon, that brings up a half/double loop length set-up, plus eight cue buttons. There’s a slip mode in here too, which is cool. The software cleverly appears to make use of the available screen size; here, the EQ & volume controls are retained alongside the FX, but on my smaller 5in device, in this mode, the volume controls disappear leaving full-screen X-Y FX pads. Hitting “FX” brings up two X/Y pads with 15 FX per side. 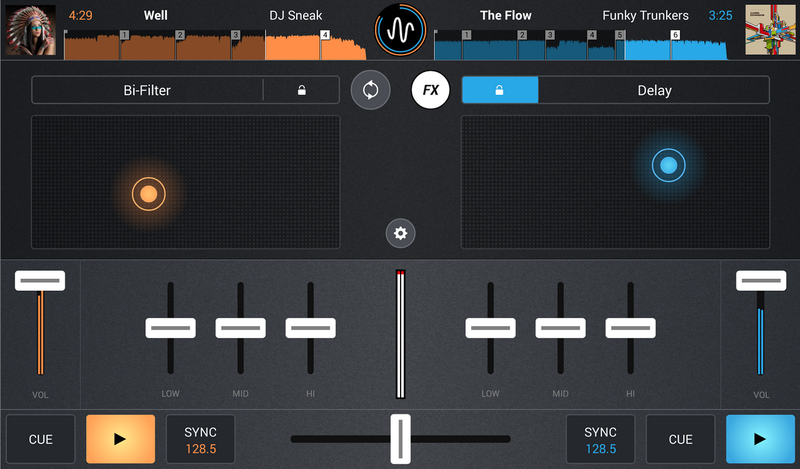 This works similar to Traktor DJ on an iOS device, with the ability to lock the chosen effect in place if you wish. They sound great, too. You can’t have, say, loops/cues on one deck and FX selected on another, though, and I feel this would be possible with a little bit of UX tweaking rather easily – definitely on the wish list for v2. There’s a little cog button for settings. This gives you access to gain controls for each deck (although there doesn’t seem to be an autogain for tracks, which is a shame), as well as a master output level. A big “quantise” button in here basically locks the beats when you’re messing with loops etc and is well worth turning on for casual DJing – it makes it sound frankly better on a tiny device when you’re not trying to perfectly time everything all the time. There’s a record button here too, and a rather limited tutorial that nonetheless gens you up on the basics. The advanced settings panel is accessible from the main settings, from where you can toggle deck protection (so you don’t accidentally load onto a playing deck), a master limiter (recommended), whether sync mode tries to lock one or four bars, record quality and pitch bend amount. As I mentioned earlier, there is a crossfader function where you can “tap” the crossfader to cut the other track in/out, and there’s an adjustment here for setting that to be to the middle (50%) or to the other track (100%). What about sound quality? Well, clearly the speakers on the Nexus 5 are pretty rubbish, but plugged into the KRK Rokit 6 G3’s that we’re testing here right now it sounded great. Likewise on headphones. We did get the odd audio glitch, but like the animation glitches, I suspect there was a system setting on the phone eating resources when we tested. Not sure though, as we couldn’t work out why in the time we had to test it. The app actually looks simpler than it is, at least on the main screen; dig underneath the surface though and it’s a pretty accomplished first go on Android. 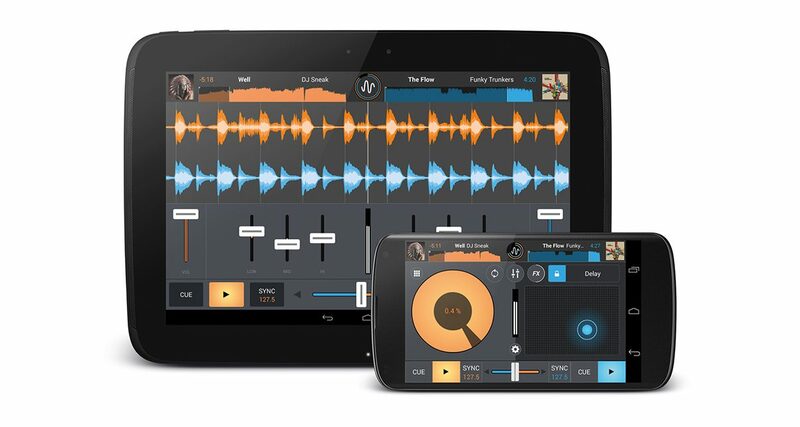 As I said earlier: Wow, an Android DJ app! For that reason alone, we need to be a bit kind here. It has lots going for it: The sound quality is good. You can record. It has decent X/Y FX. The sync engine is good. It’s easy enough to use, borrowing from both MixVibes’ own iOS apps and some of the best bits of others. Overall, it feels pretty accomplished. It works. It deserves kudos for that alone. I tested it on a smartphone, and it was fine – I didn’t feel it was particularly cramped. Bet it feels even nicer on a tablet like a Nexus 7, for instance. But… there is stuff missing. The biggest omission is any kind of pre-cueing. Mono splitter would be fine, but it needs this somehow. 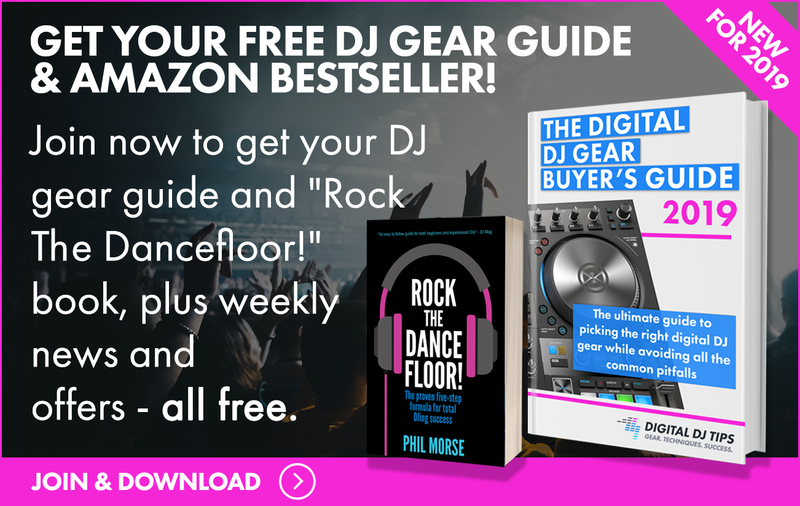 DJing is not the same without it. More: There’s no key detection or lock, no genre tags in the song library, no zoom on the waveforms (making dropping cue points accurately difficult). And for me at least it was a bit jerky with occasional sound dropouts. Getting these added/fixed, and possibly autogain too, would add an extra star to our score and make this a perfectly acceptable serious app for any DJ on Android. I am sure these improvements are not going to be far away. Past that, to be considered alongside the best of the best DJ apps on iOS, we’d need to see the ability to use external hardware (sound cards and/or controllers), and better library integration with syncing of metadata between devices. How possible any of this actually is on Android I truly don’t know. 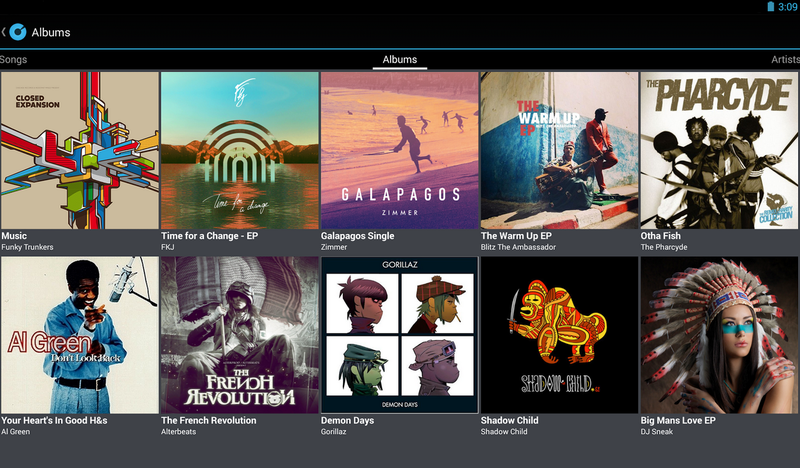 For now though, if you’ve got an Android device and you want a decent enough DJ app to mess around on, this is it: Go and grab it now. Hopefully, the next version will correct some of the things I listed above, which would make it easier to recommend. Onto the bigger question as to whether Android can ever rival iOS as a DJ platform? Jury’s out on that one. 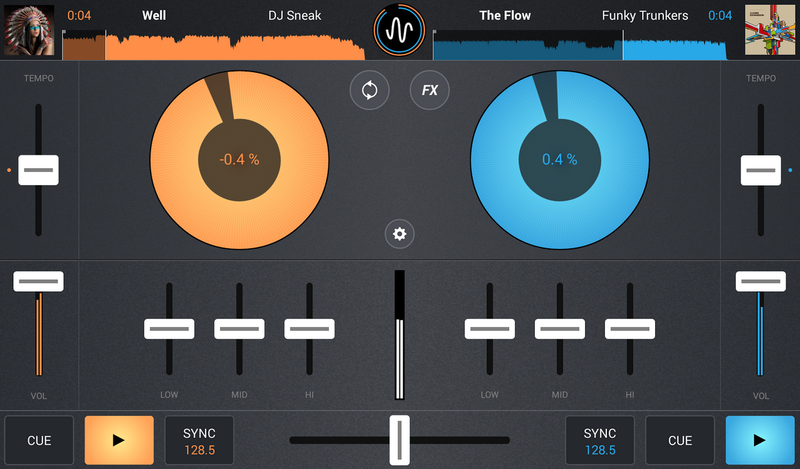 Mixvibes Cross DJ For Android has certainly taken a big step in the right direction. Yes, that is a big downside if they haven’t fixed that. Personally, I haven’t used this app in a long time but just checked and saw that the last update was in April this year. If they were to sort out the things that you mention, it would be a versatile option.